"Shopping, I have to have someone with me," she told "GMA." One of the women accusing Republican Senate candidate Roy Moore of sexual misconduct, Beverly Young Nelson, told ABC News it “sickens” her to think what might happen if Moore is elected to the U.S. Senate. “It sickens me to wonder what may go on with him if he gets into office,” Nelson told ABC News’ Tom Llamas in an interview that aired on “Good Morning America” today. 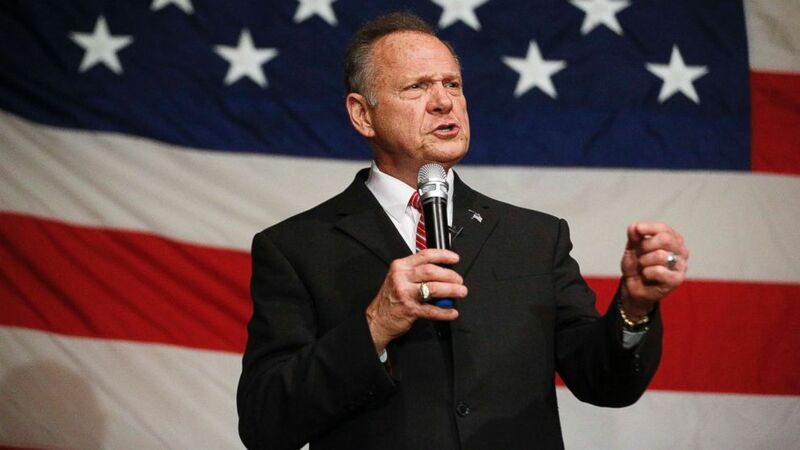 Nelson has accused Moore of groping her in the 1970s when she was a 16-year-old waitress at a restaurant in Gadsden, Alabama and he was the deputy district attorney of Etowah County and in his 30s. She said Moore, who has vehemently denied the allegation, offered her a ride home after work but instead parked the car and tried to assault her. He told her not tell anyone about the alleged incident, she said. Moore has repeatedly denied her allegation, as well as those from other women who’ve accused him of sexual misconduct. “These allegations are completely false. They're malicious. Specifically, I do not know any of these women, nor have I ever engaged in sexual misconduct with any woman,” he said last week before a crowd of supporters at a rally in Henagar, Alabama. (Brynn Anderson/AP) U.S. Senate candidate Roy Moore speaks at a campaign rally, Dec. 5, 2017, in Fairhope, Ala. But Nelson told ABC News that Moore’s comments “really hurt” her and that she hopes for an apology. “God knows and Roy knows that I know what happened. And he will have to answer to that one day,” she said. After going public with her allegation last month, Nelson added, her children have been threatened and she's afraid to leave her home. "I’m scared to go anywhere. Shopping, I have to have someone with me," she said, adding that her father takes her to doctors' appointments. Despite the allegations, however, Moore still has lots of support. A CBS News poll released Sunday found that 71 percent of Alabama Republicans believe the allegations against Moore are false and that half of Moore’s supporters would rather back Moore because they want a conservative in the Senate, and not a Democrat. (ABC) Roy Moore accuser Beverly Young Nelson spoke on GMA, Dec. 8, 2017. Nelson went public with her allegation after the Washington Post first reported on other allegations made by four women. “Maybe I do. But I thought all this time, all these years I thought I was his only victim. I probably wouldn’t have come forward if it hadn’t been for the other four girls that came forward." She also showed on “GMA” her high school yearbook, which she said Moore signed before he allegedly tried to assault her. “I had wrote under it where it happened at,” she added, referring to where she said they were when she said he signed the book. “I want to make this straight." Moore has denied it’s his handwriting, and his campaign and attorney have called for her to release the yearbook so a handwriting expert can examine and evaluate it. Nelson has not done so but insists that Moore signed her yearbook, though she made notes underneath to remind her who Moore was and when and where she said he signed the book, her lawyer, Gloria Allred, said at a news conference this afternoon. Voters in Alabama head to the polls Tuesday to decide between Moore and his Democratic challenger, Doug Jones, to fill the Senate seat vacated this year by U.S. Attorney General Jeff Sessions.